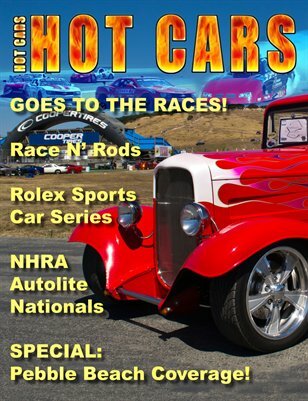 In this special edition of HOT CARS magazine we go to the races!! First up is the Rolex Sports Car race that also features a car show at Laguna Seca Raceway. Then we're off to Infinion Raceway in Sonoma for the NHRA Autolite Nationals drag race, that also has a car show. But then, we return to Monterey and the Pebble Beach Concours d'Elegance!! We bring you special coverage from this world famous car show. Dave Lozano shares his Boyd Coddington built '32 Ford Sedan with us, and we check out a painting by Mark Townsend in our Auto Art section. Very cool issue!